July marks Canada's 150th anniversary and Canada's Wonderland is celebrating all month long with Canadian-themed live entertainment, special events, and unique Canadian food! Our family wanted to get in on the fun so we headed back to the park last week. Here's a sneak peek at what the celebration is all about - we had such a fun time! 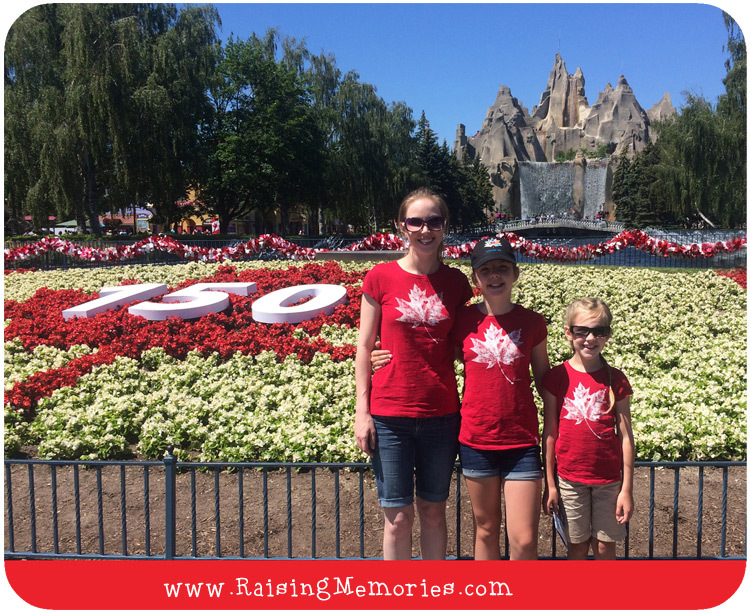 We didn't have to take more than a couple of steps into the park to see that Canada's Wonderland is celebrating Canada's 150th! There were signs, flags, and flower gardens in Canada's red and white. We even spotted a "Canadian Mountie" walking through the park, on stilts! We rode the rides to our hearts' content during our visit to the park in May, so for this visit, we focused on all of the fun shows the park has going on in July, and the Splash Works water park (which wasn't open when we were there last). 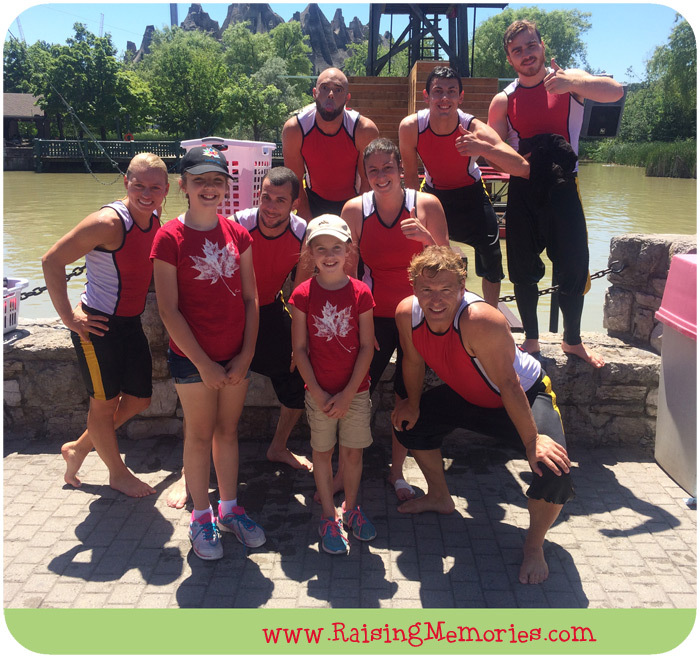 Our favourite show was the Flying Frontenacs Stunt & Dive Show! This team was so impressive with their trampoline tricks, high dives, and a really impressive stunt involving something that I can only describe as a cross between a water jet pack and a hover board (you need to watch the video below to see it!). The girls loved getting to pose for this photo with them after the show! The West Coast Lumberjack Show was both impressive and amusing. 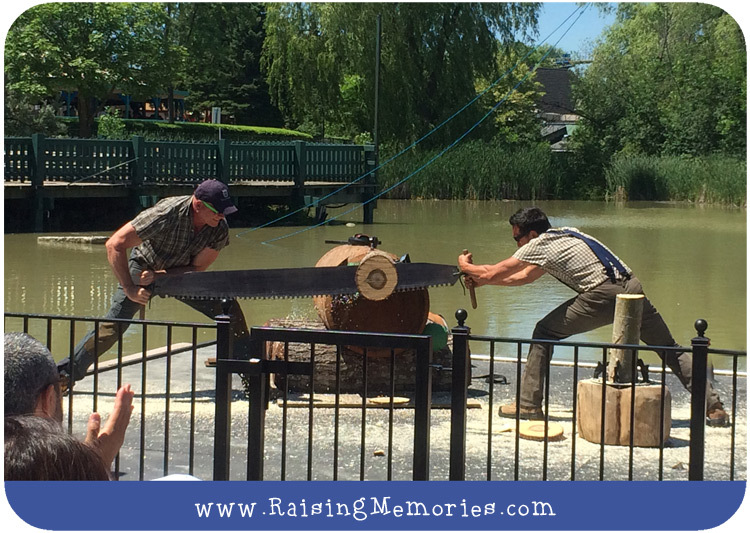 It was a mix of daredevil lumberjack skills (log rolling, tree climbing, chainsaw carving) and a healthy dose of humor. I got some of it on video as well; make sure you check it out! After some shows, we headed to the water park. 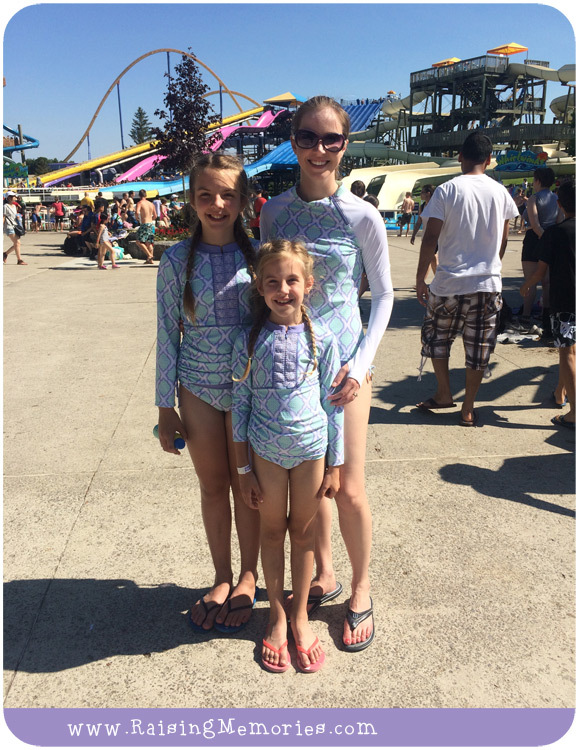 The girls had a lot of fun in the wave pool where we met up with some friends. They wanted to avoid waiting in the lines for the slides, and were quite happy to hang out in the wave pool the whole time to play and cool off! Next up was the Ultimate Thrills Circus. This one involved high wires, motorcycles, contortionists, and a lot more! We were impressed by some very daring stunts that even had the adults in our group feeling nervous! One of our favourite parts was this contortionist who shot an arrow at a balloon with her feet!! Seriously - check it out in the video! So now let's get to that video! It's less than 3 minutes long, but it gives you a representation of all of the shows I've mentioned as well as the cliff divers that perform extremely high dives off of Wonderland mountain! At the end of our day, we gathered on the bridge between Wonder Mountain and the Royal Fountain, to watch the light show: "Starlight: Northern Reflections". I really wish I could have gotten some good video of the show for you, but my phone just wasn't cutting it. I did get a few photos that will give you a small idea of how awesome this show was. Between the lighting, music, lasers, and water effects, this is a show you don't want to miss! I'd love to see it again; it was so impressive! 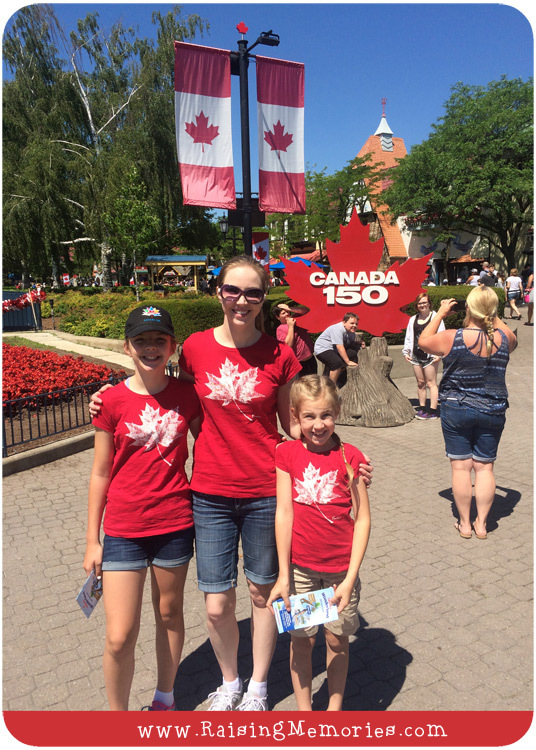 Canada's Wonderland is one of our favourite places to go in the summer because there's something there for every age and interest. This trip was particularly fun because of the focus on celebrating Canada and we all loved the shows! 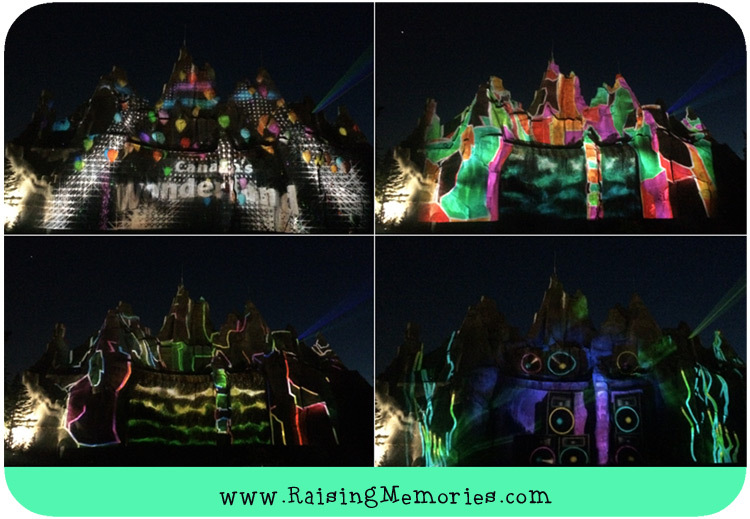 If you're going in July, I suggest you be sure to see the Flying Frontenacs, and the Light Show- they were our absolute favourites! There's another show called Cirque Canadien that I'm sad we missed (if you want to see that one, don't go on a Wednesday like we did, it's the one day they don't have shows). If you can't make it in July, don't worry, there are lots of other great shows scheduled throughout the whole season. You're sure to have a blast! Sounds like an amazing time! I haven't been to CW in ages, but would love to head there with the nephews for their waterpark! Would love to see the Ultimate Thrills Circus! Looks fun! I think the shows would make a nice break from the rides. Maybe next time when we take the kids. It was great for that! Especially on a busy day with long lines. Fun! I had no idea they had special activities. Love those photos with the red shirts and flowers! Thank you! :) Yes, they have a lot going on with activities and shows during the summer! first of all - I love the matching shirts and bathing suits!! Secondly - I've never stayed for the starlight show at night - looks amazing. I'll have to go back for a date night I think!! Thank you! :) It was a great night show! Yes!! The best part! (seeing you, I mean) ;) I'm so glad I spotted you! First of all, I LOVE that you and your girls match in both tshirts and bathing suits!! I love the Canada's wonderland went all out to celebrate their 150th!!! Those shows look fabulous!! Thank you! :) They were great shows! 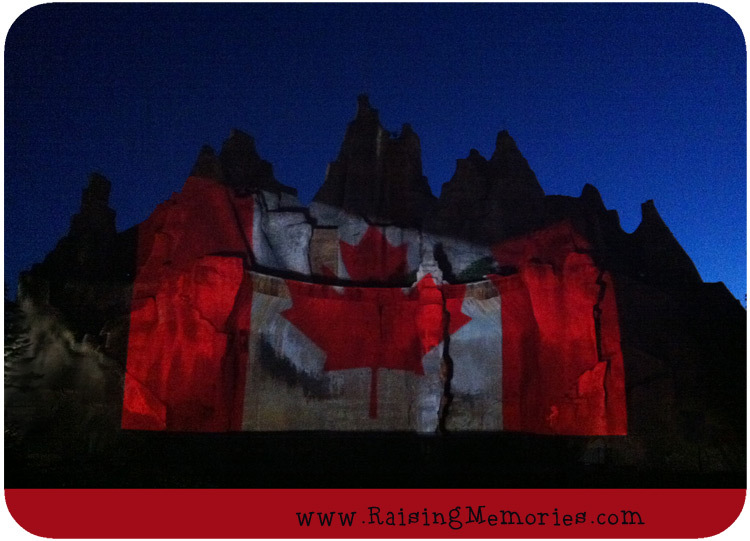 Wow...there's so much to do at Canada's Wonderland - I've never been and it's definitely on my bucket list. Definitely- it's a full year-long celebration! It all sounds amazing, wish we lived close enough to have experienced all this.